President Trump is likely to sign a repeal of the Obama administration’s Fair Pay and Safe Workplaces rule any day, but controversy over contractor disclosure requirements could linger. Already one tiny agency appears willing to row against the tide of repeal. The independent Chemical Safety Board on March 1 voted 4-0 to declare “unacceptable” the Federal Acquisition Regulatory Council’s response to a request for stronger reviews of potential contractors’ workplace safety programs. The Chemical Safety Board had investigated an April 2011 explosion at a fireworks storage facility in Waipahu, Hawaii, leased by Donaldson Enterprises, in which five workers died. In its January 2013 investigative report, the board had recommended that the FAR council “establish an additional contractor responsibility determination requirement” that would require a focus on “incident prevention and environmental and system safety,” the board’s summary said, noting that such a requirement does not currently exist. 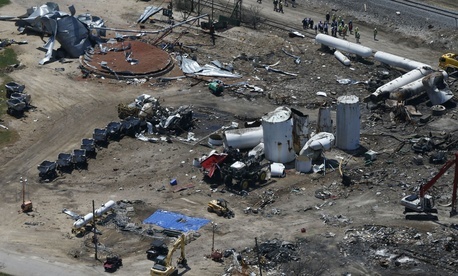 “At a minimum, the language should specifically require the review of a prospective contractor’s environmental and safety programs; safety record and incident history; ability to use safe methods for any work involving hazardous materials (including explosives); and suitable training and qualifications for the personnel involved in the work, including prior relevant safety experience,” the board said. President Obama’s original order aimed to protect contractor employees from wage theft and unsafe working conditions by requiring employers bidding on federal contracts to disclose violations and alleged violations of 14 federal labor laws and similar state labor laws. Contractors resisted it as burdensome “blacklisting” and blocked in court parts of the final rule in court. There is other unfinished business with the Obama rule. Some of the provisions not blocked in court took effect in January, including the paycheck transparency sections, as noted by Eric Leonard, a partner at the Wiley Rein law firm specializing in government contracting.